There are many reasons for sewer drain line blockages. The line may have settled, became disjointed, been crushed, punctuated or broken. Tree roots are usually the main cause of damage. 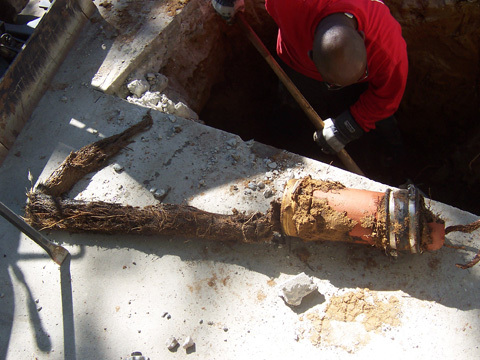 Constantly seeking moisture, tree roots find their way into your sewer line and over time can cause a major blockage and even rupture the drain line. A clogged sewer line is a serious problem, one that you want fixed fast and fixed right. Our professional plumbers can handle any sewer line repair or replacement. The first step is to find the source of the problem by performing a video sewer line inspection. A small, video camera is snaked through the line allowing your sewer professional to visually inspect and evaluate the drainpipe and locate the cause of the blockage. Once we have an accurate diagnosis, your plumber will review the problem with you and determine the best approach to your sewer line repair. Whether it�s a simple repair or major replacement, we�ll explain all options and provide you with upfront pricing so you know the exact costs involved before any work begins. If you�re experiencing a clogged drain or other drain issues call us today, we�ll quickly respond to your needs and get things working properly. All work and your satisfaction are guaranteed 100%. Whether you have old, broken, or root infested sewer lines, we can replace your old pipes with new, seamless polythylene pipes, saving you time and money in the process. This trenchless technology is referred to as pipe bursting, and only requires a minimum of digging. We use seamless pipes during this process, eliminating joints that allow root intrusion and exfiltration. Your flow capacity will also be increased, making your entire plumbing system more efficient. Having trenchless sewers installed will also save you money, because you will not be paying for the labor involved in digging up your yard and driveway, not to mention the cost of putting it all back after the sewer repairs are done. No one wants a big mess in their yard after they have worked for years to get it just the way they like it. The structural strength of this type of trenchless system is just as strong as any other type of sewer repair and installation process, so it makes sense to save your yard and driveway as you enjoy the benefits of a new sewer system in your home. Trenchless sewer repair can save your yard and landscaping from being entirely ruined. It also saves your driveway, by not having to dig up every inch of your yard to install a new sewer system. We offer the new trenchless sewer technology to repair your pipes and keep your yard intact, as well as your electrical, gas, and water lines.